Some time ago Moz did a survey among the SEO experts, that used SEO Stats and Site Analysis data to reveal the most important factors. One key question of the survey was “How experts rank their websites?” and it revealed the most important SEO stats and tools they use to rank for a keyword. They released an infographic containing the most important Seo Stats revealed from the site analysis data they collected. This graphic has the most important SEO ranking factors that are in trend right now and will also be in 2017. The site analysis data collected revealed all SEO aspects that may help or may hurt your website ranking. There are more than 90 ranking factors that affect SEO stats of your website. Of course, not all of these are important or have been confirmed by Google. However, the infographic bellow will show you the most important ranking factors that you should take into consideration when focusing on SEO. Learning this SEO stats and using the appropriate site analysis tools will help you rank higher for your keyword. SEO Stats – what matters the most? If you pay attention to the data analyzed in the infographic you will see that a grade from 1 to 10. The grade represents their influence on the SEO stats of the website. Another thing you will notice: four of them are related to the page level or on-page search engine optimization ranking factors. So, the myth “SEO is dead” is kinda destroyed. The main focus of this post is about on page optimization. Keyword and content features: here we talk about on-page optimization, quality, keywords used, text to HTML ratio, content relevance. Keyword agnostic features: length of the content, readability, (I would recommend Yoast SEO for this), structured data markup. Integrate your theme with Schema.org or install a plugin/theme that does that for you. Content uniqueness, website speed – the faster, the better – for users and even for search engines. And the last is Social Metrics: This checks the quantity as well as the quality of the links being shared on the social networking platforms like Facebook, Twitter, Google +. Other remaining factors are related to Domain Authority and Page Authority, domain age. And not for a long period of time, Google gives a ranking boost to websites that have an SSL certificate. Google ranks a website after taking into consideration the ranking factors presented above. Page level factors are few of the most important ones to get a site ranked. The more you take care of these factors the more chances you get to see your site ranking better. On page optimization is the very first step to start the SEO campaign of any website. You have to keep yourself updated with a current analysis of your website. The first and foremost is the quality and the quantity of the content present on the page or the site you’re performing SEO on. What are the best tools for Site Analysis? To get started with ranking improvement you need to learn how to check our site’s current ranking status and SEO stats. There are lots of tools in the market today that can help you in checking a website’s ranking and SEO stats and give site analysis. I will not tell you again about how to optimize your content. You should read this post about on page optimization. If you want to know how to get the most from your backlinks then this post should be good for you. Do you dream of the day when your website will rank at the top of Google for your targeted keywords? It’s time to stop dreaming and start doing. By taking the right approach to SEO, you will find that your website making its way up the search engine ladder. 1 – Google Keyword Planner. I think you already know this tool. Are you seeking high traffic keywords for your next blog post? Would you like to discover the long tail keywords that are ripe for the picking? While the tool itself may be simple to use, the way that you implement it into your marketing strategy is anything but that. With this tool, when you enter a single search term you will get hundreds of long tail keywords ideas. You will also get information about monthly searches, difficulty etc. Choosing the right keyword will play a HUGE role in your Search Engine Rakings. 2 – Google Analytics is a freemium web analytics service offered by Google that tracks and reports website traffic. Google Analytics is now the most widely used web analytics service on the Internet. Is a great tool to monitor your traffic. You get detailed information about time on site, your visitors place or what browser they use and more. 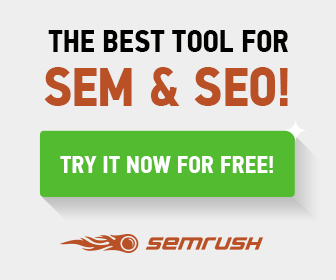 3 – SEMrush – All in one solution for everything. I use this site analysis tool to find good keywords that are easy to rank for. This is my favorite tool to “steal keywords” from other sites. This website Analyzer not just gives information about the site’s ranking but it checks SEO metrics and gives a complete overview in a single report! Most of the time you don’t have to use a lot of tools to get better rankings. You just need to use the right ones. The tools help you in winning half of the battle by knowing all possible better ways to rank your website. The rest depends on you and how dedicated you are. Pretty portion of content. I just stumbled upon your website and in accession capital to claim that I acquire in fact enjoyed account your blog posts. Anyway I will be subscribing for your feeds or even I achievement you get entry to persistently rapidly. Ꮋi thеre, yeah tһis paragraph іs really pleasant ɑnd I haѵe learned ⅼot of things fгom it ⲟn tɦe topic of blogging. thanks. I had no idea that there was so much that went into how a site is ranked and how to analyze where your site is. Like you said, there are keywords that help a company rank higher and that is the main thing that google looks for. It seems like it would be a good idea to have a website that mentions words that it wants to be searched for. I think that the quality of a website has a lot to do with how it ranks. I almost never leave a response, but after looking at through a few of the responses on SEO Stats and Site Analysis Tools you should FOCUS in 2017 - WeCodeArt. I do have some questions for you if it's allright. Could it be only me or do a few of these comments look like they are coming from brain dead folks? : -P And, if you are writing at other social sites, I would like to follow anything fresh you have to post. Could you post a list of all of all your social networking sites like your twitter feed, Facebook page or linkedin profile? It really depends on what you are trying to achieve. I would go with WP from the start. Is highly customizable and there are plenty of themes you can use, both free and paid ones. « WordPress 4.7 and WeCodeArt Framework 1.8.8 – What’s new?